My Mini Is Too Small But I Don't Want Something Big! What Car Should I Buy? Courtney loves her Mini Cooper for zipping around in the city. But now that her little guy is getting bigger and the car is starting to have some issues, it’s time for an upgrade. She needs something comfortable but stylish without being too big. What car should she buy? I am a mom of a pre-school boy and I currently drive a 2012 Mini Cooper two door hatchback that I purchased new in 2012. I take him to and from school three days a week and then have to parallel park my car on-street in downtown Denver for work. While the Mini is cute, fun and awesome for squeezing into parallel parking spots in the city, my son complains about how cramped the back seat is (he’s tall and going to be even taller). Moreover, my Mini is starting to have issues—we had to replace the CVT transmission already and there have been a few recalls. UGH! I don’t drive fast or have performance needs. I am a design-conscious mom who wants to look cool when dropping off the (tall) kid without breaking the bank or having to drive a tank around the city. The car has to be comfortable and all-wheel drive, some modern technology would be nice. I can spend up to $35,000. As a former Mini owner, I can understand where you are coming from with wanting something a bit different that makes a statement. The problem is that most of the cars that stand out in the crowd aren’t always the best when it comes to reliability, as you have learned. And when you say “design conscious” that can be interpreted a few different ways though I imagine you mean something with some visual flair. I wanted to find you the very sharp Volvo XC40 but those cars are super hot sellers so scoring one near $35,000 isn’t in the cards. So maybe there is another way to do look at this “design conscious” approach in terms of features and packaging efficiency. If you alter the perspective a bit, you land on the Volkswagen Golf Alltrack. It’s not large, but the rear seat can fit an adult comfortably so your little guy should be fine and the cargo area has a massive amount of usable space given the size of the car. All Volkswagens that are 2018 model year and beyond have a six-year, 72,000-mile comprehensive warranty, reducing the stress of driving a European car. Plus, very well equipped models fall right around $35,000 before discounts. The Alltrack is easy to drive, easy to park and returns around 30 MPG on the highway. If you would like to make a visual statement go for a funky color like green or blue. I feel your pain, Courtney. 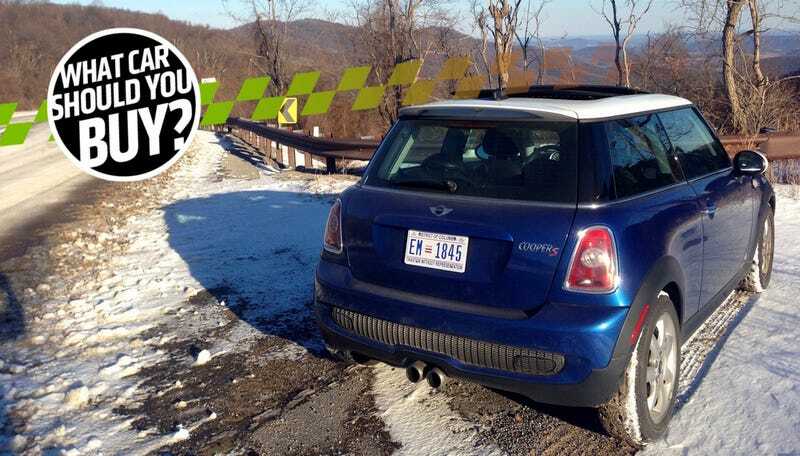 We had a 2008 Mini Cooper S and while it was a ton of fun when it worked, it didn’t work often enough to be worth it. For a while I was paying $1,200 every other month for engine and gearbox repairs. And I try to fix my cars myself, but this thing was just above my ability. I should note that later we owned a 2015 Cooper S, the one with a true BMW engine and platform this time, and in 30,000 miles we had zero problems at all. I do think the newer Minis are a lot more reliable than they used to be, but no one blames you if you don’t want to chance it a second time. The solution, I believe, is to go Japanese. And since you seem too cool to drive a boring crossover, how about the new 2019 Mazda 3 hatchback? The Mazda 3s are always among the best, most stylish and most fun “normal” cars you can buy, and it’s a nice size boost over the Cooper without being too huge—or too slow. We’ll know next week when we drive it if it’s any good or not, but considering how good past Mazda 3s have been, I have zero doubts. These aren’t on sale quite yet—they should be soon—but I am certain you can nail one down for under $35,000. Hell, probably a nice one can be had for around $25,000. Call your local Mazda dealer today and see if you can set it up. If you’re really set on something all-wheel drive, maybe grab a Subaru Crosstrek and be done with it. But if you’re okay with mounting a set of winter tires each year, you might want to take a look at the Nissan Leaf or the Chevy Bolt. It sounds to me like you do a lot of city driving, and that low maintenance is important to you. And while I can’t vouch for the Nissan Leaf or the Bolt specifically, I can say that electric vehicles in general require much less upkeep than vehicles with internal combustion engines. They’re just mechanically simpler. And if you do lots of city driving, they make a bunch of sense from a cost-to-operate standpoint. The entry level 60 kWh Leaf promises a decent range of 226 miles, and is expected to start at around $36,000. Throw in the federal $7,500 EV credit, along with whatever credit you get in Colorado, and you might have a decently long-range EV in your driveway for 20-some thousand dollars. Not bad. The Chevy Bolt also gets over 200 miles of estimated range, carries a similar price tag, and offers about as much room as the Leaf, which is a good amount—plenty for a small family. Check out the EV infrastructure in Denver before making this choice, but it may be time for you to consider going electric if you haven’t already. Expert 4: Raphael Orlove — Oh, You Want Practical Style? All of my coworkers’ suggestions are wonderful, offering practicality, new-car reliability, and some style, too. But I would be remiss if I didn’t show you that you could peg the style meter so hard that it would spin around and explode. I am, of course, talking about the Volkswagen Type 3 Notchback, the holy grail of old VWs. These are extremely rare here in the States, which is a shame, as they offer more space than a Beetle, have a bigger and more usable engine than a Beetle, and look impossibly charming. Also it has two trunks. One in the front, one over the engine in the back. You could also go for a Squareback two-door wagon, if you wanted even more space. The engine hanging over the rear wheels also means good traction for such an old car, and winter tires are not only cheap, but every auto tech beams with joy when they see this thing roll in. VW parts are probably the most affordable and accessible in the entire old car world, and there’s probably not an easier vintage machine to own than one. Most VW people feel these cars are unattainable as we’re all cheap, but this mega-lustworthy example, recently completely refreshed inside and out, is within your price range. I Want Exotic Car Looks But I Don&apos;t Have Exotic Car Money! What Car Should I Buy? I&apos;m Moving To Maui! What Car Should I Buy?